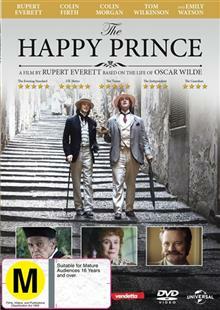 The last days of Oscar Wilde and the ghosts that haunted the mare vividly evoked in Rupert Everetts directorial debut, The Happy Prince. After being imprisoned in England for his love affair with Lord Alfred Bosie Douglas (Colin Morgan), Wilde is penniless and in poor health, stu... read full description below. 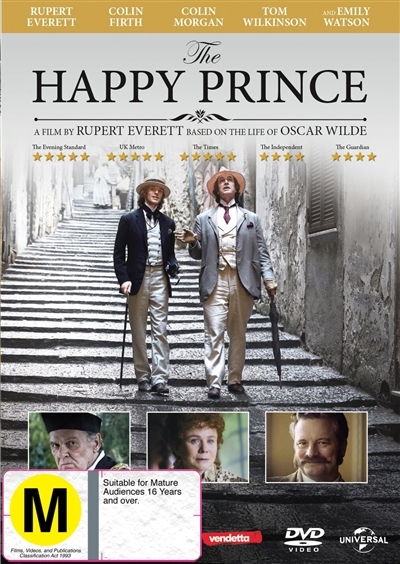 The last days of Oscar Wilde and the ghosts that haunted the mare vividly evoked in Rupert Everetts directorial debut, The Happy Prince. After being imprisoned in England for his love affair with Lord Alfred Bosie Douglas (Colin Morgan), Wilde is penniless and in poor health, stumbling the streets of Paris. Out of prison, he survives by falling back on his flamboyant irony and brilliant wit that defined him. Oscars thoughts are imbued with love and betrayal and permeated with those closest to him: Bosie, his literary agent Robbie Ross (Edwin Thomas), his great friend Reggie Turner (Colin Firth), and his estranged wife Constance (Emily Watson). As the film travels through Wildes final act and journeys from England to France to Italy, desire and loyalty face off, the transience of lust is laid bare, and the true riches of love are revealed.